FISH WITH THE STARS - MNDA Charity Event 2011. It was attended by over thirty celebrity carp fisherman who gave up their time to fish with anglers who had made donations to the charity and had been invited to fish alongside them. Thirty four celebrity anglers took part and on the first day of the event there was a special visit by John Wilson and Martin Bowler who both spent the day there meeting everyone. EastEnders star, Scott Maslem, who plays Jack Branning in the series came along to fish and presented Linear with an Albert Square sign – signed by all the cast. This is being auctioned on the Linear website. 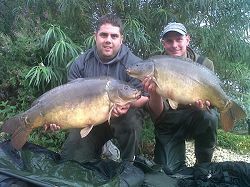 A number of good carp were caught including a fish of over 31lb. Everyone said they enjoyed the event and were keen to be invited again if it were to continue. 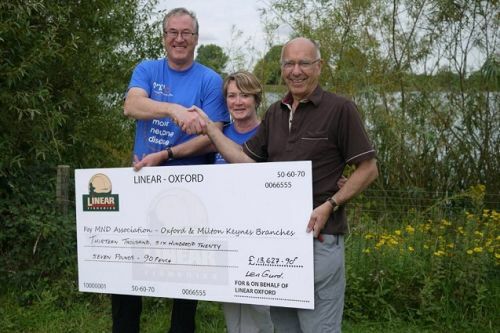 There was a raffle and auction in support of the event and on the last day Linear were able to present MNDA Chairman Charles Reece with a cheque for £13,627.90, although this is not the final figure which is expected to be at least £3,000 higher. Spokesman for Linear Fisheries and one of the main organisers of the event, Len Gurd quoted – ‘It is unbelievable how much support we have received from the fishing world. This was intended to be a one off event but I am sure we will now run with it every year. This charity organisation is very close to my heart as it is for many who have lost someone dear to them because of this tragic disease. There are so many people I would like to thank but there is one lady in particular whose help I could not have done without, that is Fran Best a volunteer MND Association visitor and fund raiser. Her hard work throughout was an inspiration to us all’.